Welcome to Laughing Buck Farm! through the rhythms of the seasons and hands-on learning and play-- all in an outdoor, farm setting." Browse around the site and see what we have going on. Better yet, come on out for a visit in person! for ages 1 - 15! Get your kids outside this Summer! so YES you will find us having Farm School rain, shine, mud and snow. We also welcome all abilities so let's see how your child can be included in our programs. Click here for more info. Use the contact page for questions or to RSVP. 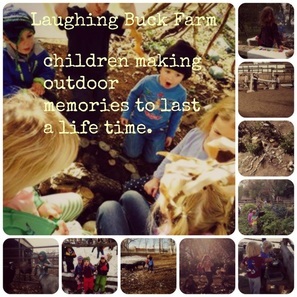 what folks have been saying about Laughing Buck Farm.